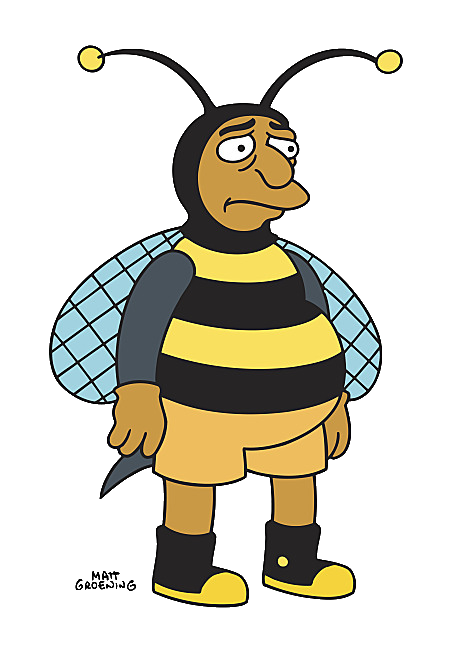 Welcome to comics on Wikisimpsons, the wiki about The Simpsons that anyone can edit. 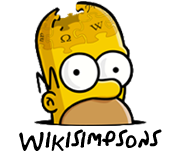 On this wiki, started on September 24, 2005, we are currently working on 37,247 articles. Register an account and join in the editing! 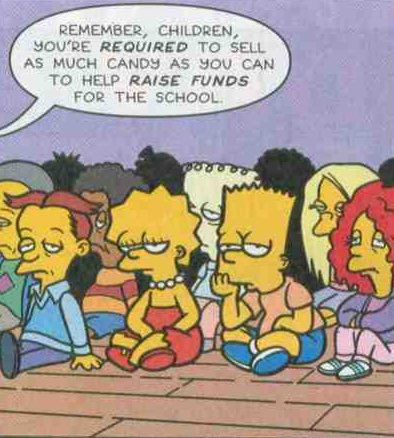 Day of the Nerd is a Simpsons Comics story that appears in Simpsons Comics #73. The school children are tasked to sell chocolate in Springfield and before Lisa starts selling, she goes home to watch a Mars rover documentary. Homer drives her to Shelbyville afterwards to sell the chocolate, as everyone in Springfield has already bought some. On the road, Homer takes a shortcut across the desert, and runs over the Mars rover on a fake Mars set. Lisa is outraged at the hoax, however she leaves when the scientists tell her there would otherwise be no space program. Later in the day, Lisa and Homer are watching the live documentary again and the words "Homer Rules" are found in the dust. A scientist attempts (probably unsuccessfully) to dismiss it as natural erosion. Meanwhile, Bart ends up at the house of Cornelius Morgan, who has an enormous science fiction collection and is considered to be Springfield's biggest nerd. Morgan is scheduled to be placed in suspended animation and is at a loss of what to do with his collection. Bart suggests he hold a competition for all the nerds in Springfield, the winner obtaining his collection. 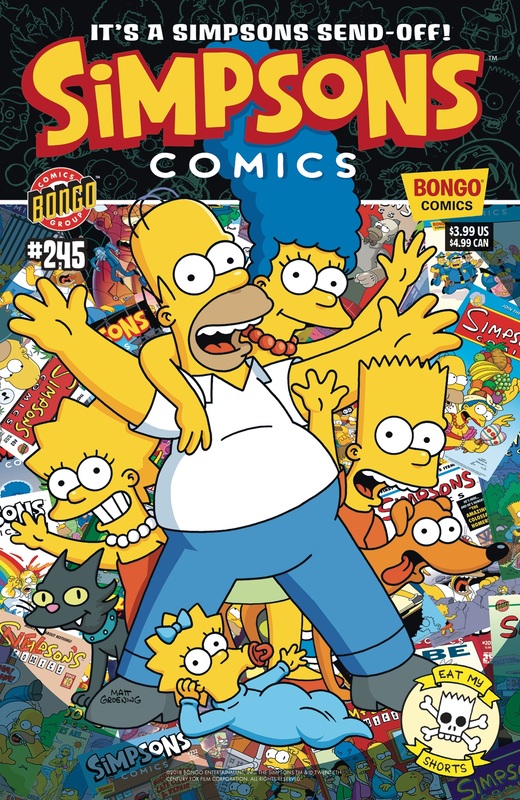 October 13, 2018: Simpsons Comics #245 was released in the USA. June 24, 2018: Simpsons Comics #244 was released in the USA. May 5, 2018: Bongo Comics Free-For-All 2018 was released. April 18, 2018: Simpsons Comics #243 was released in the USA. March 21, 2018: Chief Wiggum's Felonious Funnies #1 was released in the USA. January 17, 2018: Simpsons Comics #242 was released in the USA. December 20, 2017: Bartman Spectacularly Super Secret Saga #3 was released in the USA. November 15, 2017: Simpsons Comics #241 was released in the USA. October 18, 2017: Bartman Spectacularly Super Secret Saga #2 was released in the USA. September 20, 2017: The Simpsons' Treehouse of Horror #23 was released in the USA. August 16, 2017: Bartman Spectacularly Super Secret Saga #1 was released in the USA. July 19, 2017: Simpsons Comics 240 was released in the USA. 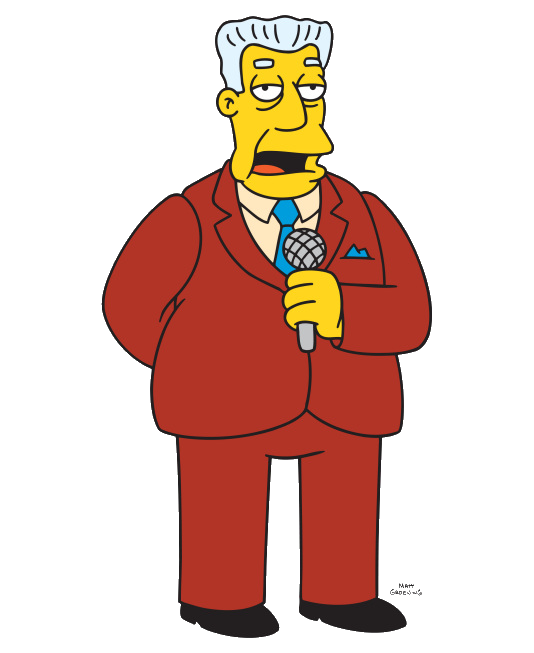 June 22, 2017: The Mighty Moe Szyslak #1 was released in the USA. May 17, 2017: Simpsons Comics #239 was released in the USA. May 6, 2017: Bongo Comics Free-For-All 2017 was released. April 19, 2017: Krusty the Clown #1 was released in the USA. March 15, 2017: Simpsons Comics #238 was released in the USA. March 22, 2017: Simpsons Illustrated #28 was released in the USA. "Daddy has to run out for just a minute, Ralphie. You're in charge 'til I get back. Okay?" "I won't be gone long, son." "Okay, Daddy! That makes me the man of the house! I'm just like Daddy now, 'cept I'm smaller and my pants are wetter."